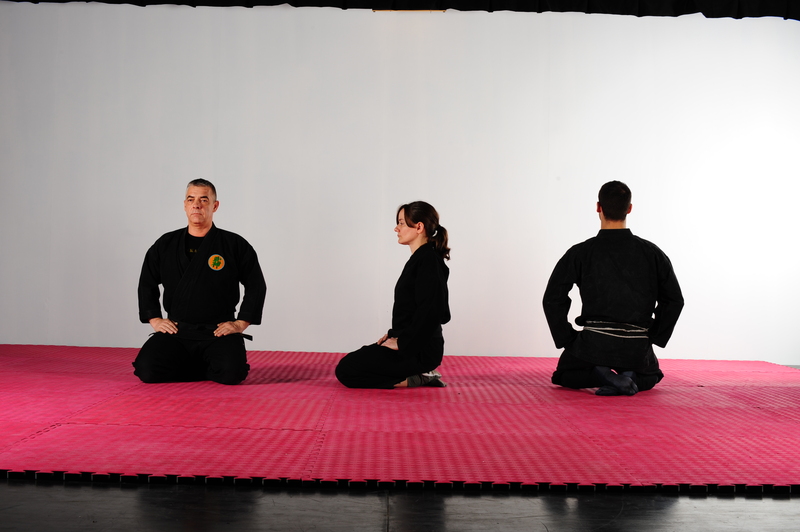 Whenever we are waiting or listening we naturally put ourselves in seiza no kamae. Over the years, this kamae has been assimilated and we do it without thinking. This is the objective we should have for every movement we learn in the dôjô; i.e. being able to do everything without thinking. By forgetting the self we forget the form and the flow is born. One day I went with a buyu to attend a sadô seminar of the ura senke school in a Zen Rinzai monastery. Even though we had explained to the superior priest and the sadô sensei that we were martial artists, our natural way of walking, kneeling, and standing was so natural that they suspected us from being sent by the Zen headquarters in Japan to check on them! Luckily we were not trying to infiltrate them like ninja. 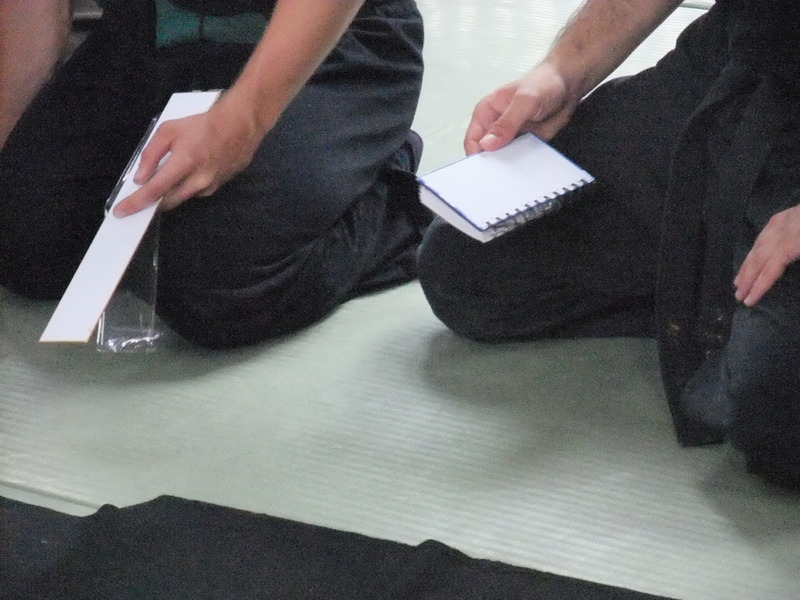 The seiza 正座 or 正坐 (kneeling with the tops of the feet flat over the floor, and sitting on the soles) or the seiza 静座 or 静坐 (sitting calmly and quietly in order to meditate) are the same but differ in their meaning; the tai gamae (体構え) is the same not the kokoro gamae (心構え). The second set of seiza is the one used in the temples for meditative purpose. The meaning of 静 is quiet, calm. Therefore “sitting quietly” can be done with or without a zafû (座蒲 or 坐蒲) and can be done even in fudôza (不動座). It deals with the ura (裏). Technical tip: the left foot is on top of the tight foot to be able to draw rapidly the sword or to move from seiza to fudôza. Train these kamae. Awesome INFORMATION as usual in this post too! Please do share with your readers the connections that this posture and others have with Indian Yoga! This posture in specific is called “Vajrasana” which is proclaimed by Indian Yogis as the best asana for meditation. This is predominantly because one can sit comfortably for a prolonged period in this Asana. `Vajra` or the thunderbolt, the powerful weapon of Indra is the allegory behind this particular yoga asana. Vajrasana is also known as the Diamond Pose. The term Vajrasana is derived from two Sanskrit words Vajra means thunderbolt and Asana means pose. The word Vajra can also translate as `va` + ra where va means to move and ra means radiant. According to its literal meaning it, Vajrasana is a pose that radiates blood supply and subtle energies to upper body.